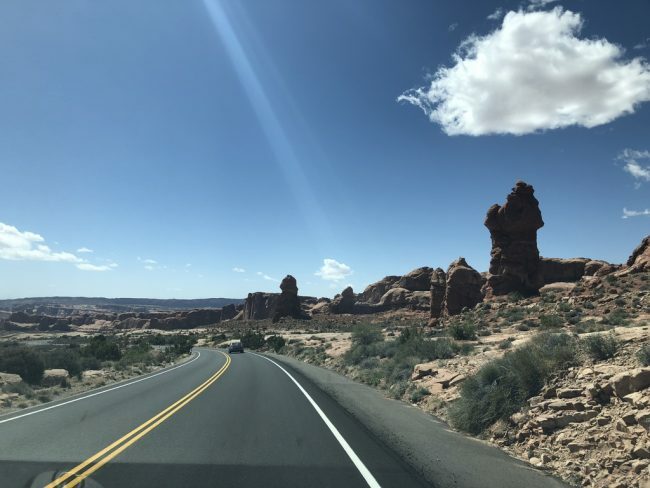 We took the Highway 12 Scenic Byway from Bryce Canyon National Park to Moab, which was our stay when visiting Arches National Park and Canyonlands National Park as part of our hiking trip through Utah. 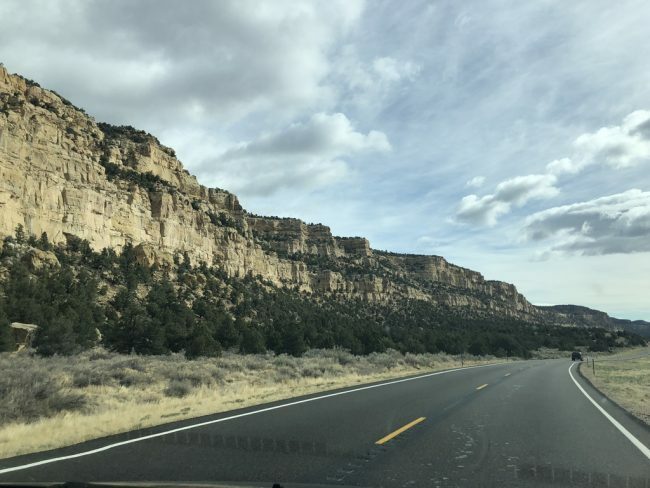 Facing a greater than 4 hour drive from Bryce to Moab, we were enticed to follow Google Maps’ advice and skip the Highway 12 detour, which would have shaved off about 30 minutes from our travel time. 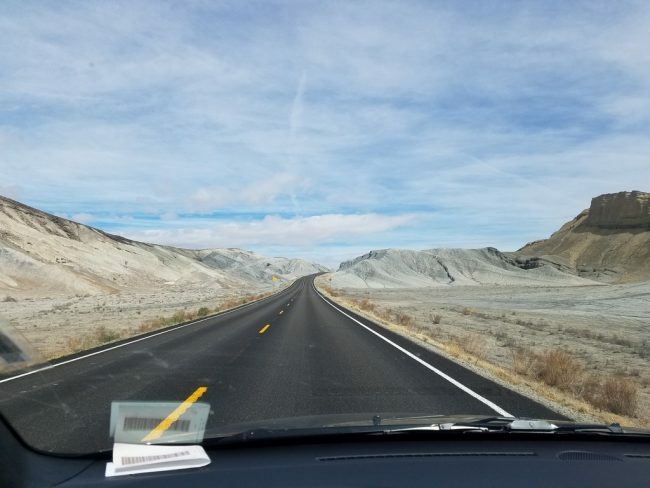 I am glad we stuck to our plan, though, because the Highway 12 Scenic Byway through Torrey, UT was one of the most memorable parts of our trip. 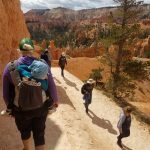 It reminded us that you don’t always need to go to a national park and hike up a mountain to see nature’s beauty. 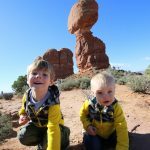 After the sandstone cliffs of Zion and the orange hoodoos of Bryce Canyon, we were excited for the famous arches and balanced rocks of Arches National Park. But first it was the washed out, panoramic views along Route 24 that took my breath away. Our time on the Route 12 Scenic Byway was a relatively short stretch of road (the full byway is about 3 hours, we only traveled the tail end it), but there was an incredible variety of landscapes between Bryce and Arches. 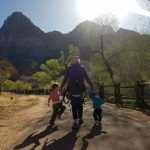 There were several stops for views along the way that we skipped because both of our boys fell asleep almost immediately and we dared not risk waking them. Some of the most amazing sights came early in the drive along a steep section of road full of hairpin turns. On the drive we passed by the Grand Staircase-Escalante National Monument and Capitol Reef National Park, two locations we definitely want to investigate further on a return trip to Utah. 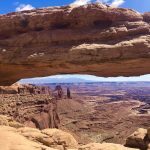 Moab served as our home for four days while we explored Arches and the Island in the Sky district of Canyonlands (Canyonlands is huge park!) We stayed at an Airbnb (this one!) just outside the main drag of Moab and really enjoyed our time there. 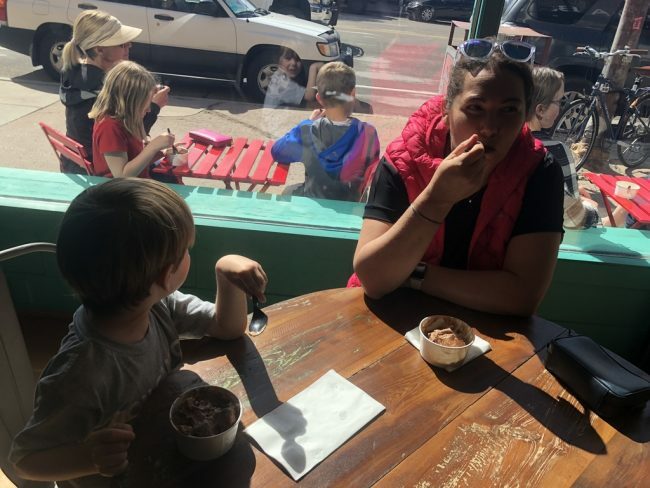 Moab’s downtown was full of coffee shops, ice cream parlors and little souvenir shops, which was a great change-of-pace after hiking. 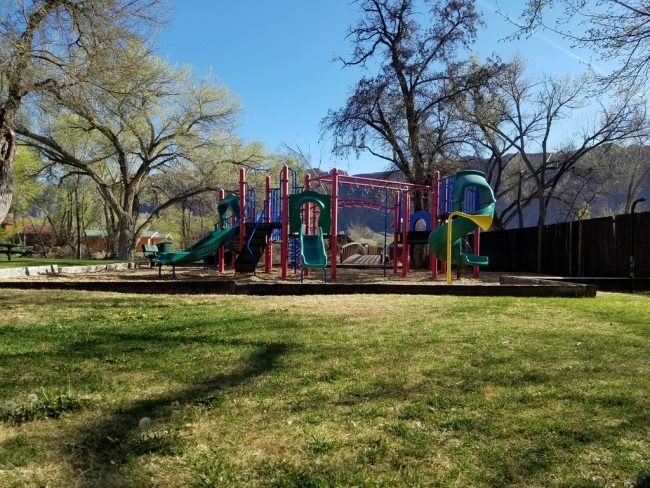 Moab also has a park and playground called the Rotary Park that was unique and is worth a visit even without kids. The Rotary Park has a large grassy field, picnic tables and a big play structure for the kids. But its most prominent feature is the bevy of unique, outdoor instruments for the kids to play. 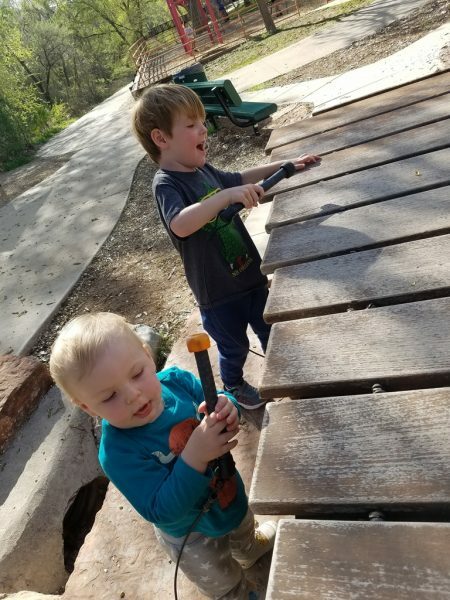 From xylophones to oversized chimes to Dr. Seussian spinning-and-clanging whatchamacallits, the music park was a lot of fun for everybody and a great surprise for us when we were just looking for an outdoor park to take the kids. The musical instruments were more than just toys, as a local showed us by playing a unique song on one of them. 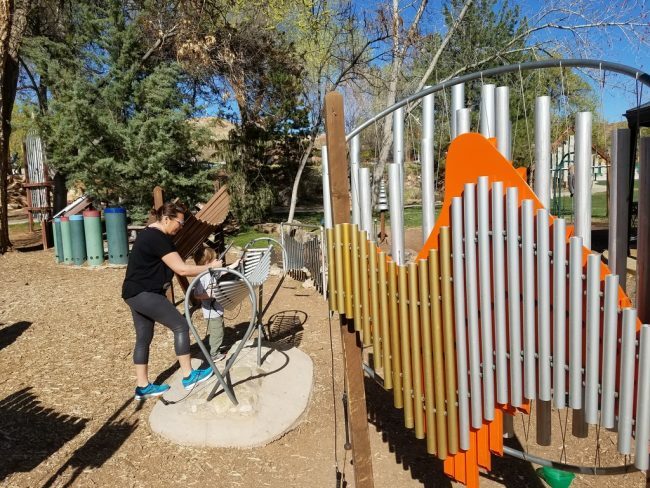 The instruments are part of an installation from Freenotes, which specializes in creating weatherproof outdoor instruments. Later, we came across some of their smaller instruments for sale at a nearby shop in Moab. 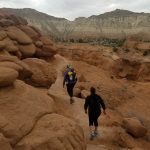 The next day we would return to hiking at Arches National Park.